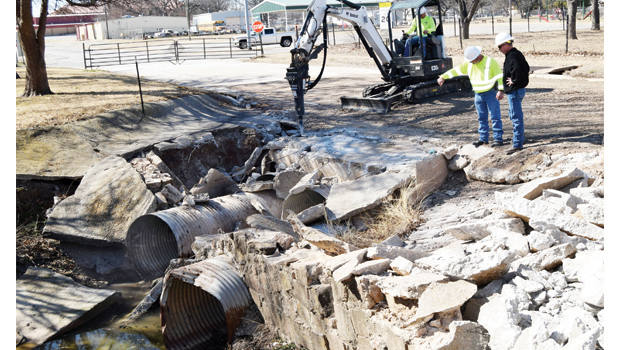 The City of Bowie has finalized its list of projects that will be submitted with the hazard mitigation plan being developed for all of Montague County. During a recent workshop in Henrietta officials from all the entities participating in the mitigation plan met to discuss the action portion of the plan. In this section the entities named project that each one is interested in submitting for possible grants. After a brief review the workshop broke into their respective groups with some staying to work on the lists and others taking them back to their offices. City Manager Bert Cunningham said those attending the meeting included Fire Chief Doug Page, Police Chief Guy Green, Code Officer David Rainey, City Secretary Sandy Page and Jay Evans, head of the electric department. Stoney Lowrance of the streets department and Dean Grant, public works director, also provided their input on the list. The manager explained these projects are ones that would mitigate problems in the event of a possible disaster, and are not necessarily problems at this time. The development of the mitigation plan began last June when the Nortex Regional Planning Commission received a $500,000 grant to create plans for 10 counties: Montague, Archer, Baylor, Clay, Cottle, Foard, Hardeman, Jack, Wilbarger and Young. Read the full story and project list in the mid-week News.